ISNES, Belgium, Aug. 1, 2018 /PRNewswire/ -- VolitionRx Limited (NYSE AMERICAN: VNRX) ("Volition") today announced that its first product the "Total Nu.Q™ Assay" research use only (RUO) kit, is ready and available for purchase through Active Motif, its Global Sales and Distribution Partner (https://www.activemotif.com/catalog/1266/NuQ-total-assay). This kit, based on Volition's proprietary Nucleosomics® technology, is the first in a range of kits due to be released over the coming months. Founder and Chairman of Active Motif, Joseph M. Fernandez, commented "We are continuously looking for innovative products in the field of epigenetics and believe that Nucleosomics® is a breakthrough technology. These RUO kits will provide researchers throughout the world with a new way to explore epigenetic modifications in circulating cell-free nucleosomes across different diseases from clinical samples. We are delighted that the first kit is now available for sale and continue to work with Volition to develop a broad range of assays focused on important targets for future roll-out. We expect revenue this quarter from the sales of these RUO kits." The RUO kits are based on the same Nu.Q™ immunoassay technology as Volition's cancer screening panels and may be used to investigate a variety of clinical questions beyond Volition's core focus in cancer biomarkers. The range of the RUO kits will allow researchers to explore patterns of epigenetic modifications in circulating nucleosomes in disease models, pre-clinical testing and clinical trials across a broad spectrum of clinical applications including cancer, inflammatory and infectious diseases and trauma. The RUO kits will offer a complete profiling solution from cell to serum. Chief Executive Officer of Volition, Cameron Reynolds, commented, "This is a fantastic achievement for both Volition and Active Motif; it was very exciting to see the first pack come off the production line. We expect that the RUO kits will provide an additional revenue stream beyond that from the expected commercialization of our blood-based tests for cancer. If the assays are developed as a companion diagnostic for another company's therapeutic, this could also potentially result in further future revenue through a licensing or similar arrangement." Active Motif is an industry leader in developing and delivering innovative tools to enable epigenetics and gene regulation research for the life science, clinical and pharmaceutical and drug discovery communities. The company has a significant portfolio of assays, genome wide services and validated antibodies for use in ChIP-Seq. Active Motif operates globally through its corporate headquarters in Carlsbad, California, regional headquarters in Belgium, Japan and China, as well as a worldwide network of sales and support offices. Active Motif applies a multi-disciplinary approach to create new and modify existing technologies to meet the current and future needs of life science researchers. 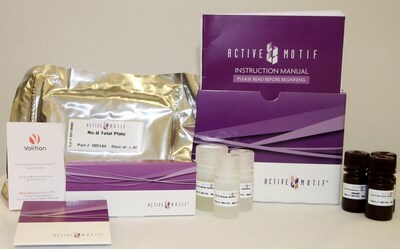 To learn more please visit www.activemotif.com. The contents found at Volition's website address, Twitter, LinkedIn, Facebook, and YouTube are not incorporated by reference into this document and should not be considered part of this document. The addresses for Volition's website, Twitter, LinkedIn, Facebook, and YouTube are included in this document as inactive textual references only. The contents found at any third party's website address are the sole responsibility of such third party, are not incorporated by reference into this document, such website addresses are to be considered inactive textual references only, and Volition makes no representations or warranties regarding such contents.